Grandparent's Day was actually yesterday, but it's celebrated by the schools all week here, to accommodate all of the extended families I guess. Grandparents typically fill in a lot of blank spaces in their children's lives and are happily there as any need arises, so it's sure nice to have a day where their family can acknowledge and honor them for what they do. The most fun part for me, is having lunch with those babies at their schools, and it sure means a lot to them, although it has little to do with the lunch. Have you had a school lunch in the past few years? Suffice it to say it's no longer the tasty, homemade meals from the past! No matter, because I can tell you that those children have such pride and joy in their eyes when we show up, and that's what matters. The weather was absolutely gorgeous this weekend and I hope you got out and enjoyed it. I had planned to go to the Biloxi Seafood Festival but found myself restricted from the sun mostly thanks to a facial burn caused by a cosmetic moisturizer product, of which I won't go into detail about here. Lets just say that it looked like I'd had a chemical peel and makeup to cover it that first day was out of the question. I was horrified, but thankfully it appears to be on the mend. Anyway, before this beautiful weather opened up we had those same rainy dreary days many of you also had, and knowing this beautiful, cooler weather was on the other side of it, I wanted a soup. Nevermind, that I know the temperatures will be back to summer-like in a few days, I felt a need to celebrate this first temporary tease of cool with a fall-ish dish. Some of you would probably think that means something sweet made with things like apples or pumpkin and harvest spices, but most of y'all know by now that I'm much more of a savory kinda gal, so soup it is and this one is a favorite. Somewhat similar to Pot Likker Soup, but in a shortcut form, this Turnip Green Soup is also known around these parts as Swamp Soup, because well, if you've ever been remotely close to a swamp, you can probably tell it's about the appearance. Kinda muddy looking with green stuff floatin' around in it! Typically made with frozen or canned turnip greens, I use a variety of cooked fresh, frozen or canned greens, and in fact, used fresh spinach here because I had a package lurking around in my fridge that I needed to use up. I just sauteed it up in a little olive oil and seasoned it with salt, pepper and a touch of red pepper flakes. I also had some leftover butter peas to use up (which, despite the name is actually a form of lima bean), so I used those for my white bean. Any southern pea can stand in here too. It's a shortcut soup, so a packet of Knorr vegetable recipe mix (formerly the soup mix) is typically used as a time saver, both to season and to provide a mix of what would otherwise be fresh cut veggies. Because we're using a mix however, I do recommend is a lower sodium broth, just to help control the sodium a bit and don't add any salt until you taste it first. You probably will not need it. I also like the heat from a good spicy andouille or Cajun sausage, which really explodes the flavor of this soup, but if you lean more to the mild side, just use a kielbasa or other milder smoked sausage. For those of us who love greens, it's a great soup to take you all the way through winter. Here's how to make it. Heat butter or oil in a soup pot and add andouille, cooking until lightly browned. Add onion, cook and stir for about 3 minutes, or until tender. Add vegetable soup seasoning mix and combine, stir in broth and all remaining ingredients, except pasta if using, bringing up to a boil. Reduce heat to low simmer and let simmer for 10 minutes. Taste and adjust for seasonings. Add pasta to individual serving bowls and spoon soup on top. Serve with cornbread. Cook's Notes: Taste before adding any additional salt. May substitute an equal amount of fresh turnip greens, spinach, or other cooked greens, or use equivalent canned greens. 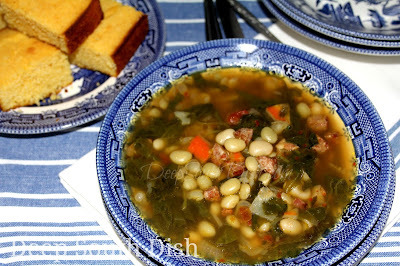 Other beans and southern peas such as cooked or canned black-eyed peas, great northern and navy beans may be used. Also okay to substitute Polish kielbasa or other milder smoked sausage, including chicken or turkey for the andouille. Nutritional Factoid: Did you know that while most canned beans are very high in sodium, draining and rinsing them gets rid of nearly half of the sodium level? Since we use a packaged product for seasoning, I recommend draining canned beans for this recipe. And, just so you know, it also helps to reduce some of those gas-causing sugars too. I can't wait to try this soup! It has everything I love in it and nothing I don't! I saw the cooked turnip greens you posted for this the other day and my mouth has been watering since! Oh lucky you Sandy!! I wish I had a neighbor like that. My hubby doesn't eat greens and I'd love to be able to take whatever I want right out of the ground! I like the beer bread with it too! Glad y'all enjoyed it!! So funny you posted this because we just had Swamp Soup for the first time while on vacation in Gulf Shores, AL in August. It was so good that I recreated it at home. The restaurant we where we had it put white and black beans in it, so I did too. And it was so good, that I'll definitely be making it again this winter! It's a tasty way to get in some greens isn't it? !